Today I made the Garibaldi’s cap, which is a pasta timbale with mushrooms, zucchini and peas. Vegetables can be replaced with others of your choice, like green beans and asparagus cut into small pieces. An interesting fact about this dish is linked to its funny name, as a matter of fact, according to some people, when you take it out of the mould, it would appear just like Garibaldi’s cap. According to others, it would seem that this dish was invented in honour of Giuseppe Garibaldi, on the occasion of his meeting with Vittorio Emanuele II, which occured on October 26, 1860 on St. Nicholas bridge, located between Caianello and Teano… Who knows! Place the oil and the chopped onion in a saucepan, let it warm up and add the diced bacon, after a few minutes add the peas and the chopped parsley, season with salt, cover and simmer for 10 minutes. In another saucepan put a knob of butter, add the mushrooms, salt and let it flavour. Cut the zucchini into large cubes, pan-fry them with the oil, then season with salt and let them cook for about ten minutes. Prepare the white sauce: Melt the butter in a saucepan, add the flour and the milk little by little. Then, stirring constantly with a wooden spoon, season with salt, pepper and nutmeg. Let it simmer for a couple of minutes and turn off the flame. Put plenty of salted water in a pot, bring it to the boil and cook the pasta. Meanwhile dice the mozzarella cheese (or provolone cheese). Drain the pasta, pour into a mixing bowl and mix in the peas, the mushrooms, the zucchini and the white sauce (or double cream) (photo 1). 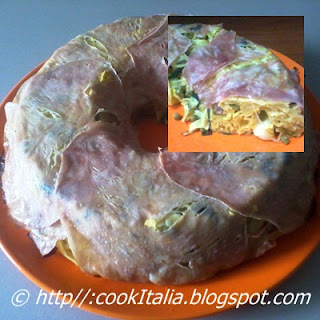 Grease with butter a ring shaped mould, cover it with the sliced cooked ham (photo 2), pour the pasta and even it out. Add the diced provolone cheese (or mozzarella cheese) (photo 3) and push it down with your fingers (photo 4), beat the eggs with a drop of milk and the grated Parmesan cheese and pour it over the pasta (photo 5-6). Bake at 170°C (338°F) for 20-25 minutes, turn over on a serving dish and serve it.